Nearest users add-on creates a new search page with an interactive map. 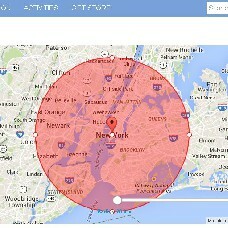 Dating site members can search for other people by radius, their own location being the starting point. The site owner and admin can indicate maximum search radius for the available search pattern (it is circle by default). This add-on requires geomap module to be installed. Geomap is included into all Dating Pro packages available in the Marketplace.